I have always looked favorably upon do-it-yourself investing (DIY). It was a prominent feature of my own book. So I was looking forward to DIY Financial Advisor: A Simple Solution to Build and Protect Your Wealth by Wes Gray, Jack Vogel, and David Foulke (GVF), the managing members of Alpha Architect. GVF took on an ambitious project in that they cover a broad range of subjects from the theoretical ideas of models versus experts, proper investment evaluation, and behavioral finance to the practical applications of value and momentum investing, market timing, and asset allocation. Part 1 of the book is “Why You Can Beat the Experts.” Beginning with the Preface, GVF says it is best for investors to maintain direct control over their own accounts. They point out the misalignment of incentives and objectives between owners of capital and investment managers. Even though more concentrated portfolios usually perform better over the long run, managers prefer to hold broader portfolios that have less of a chance of deviating from benchmarks in the short run. Outperforming benchmarks gives managers little or no reward, while under performing can get one fired. In Chapter 1, GVF presents evidence that model-based decision making gives better results than discretionary decision making. Simple is better than complex, yet “experts” often favor complexity so they can charge higher fees. GVF points out that the decision making process has three components: R&D, implementation, and assessment. Experts may be useful for model R&D and assessment, but are not usually necessary for implementation. Experts’ use of qualitative information and additional data is often of little or no value. Experts can also suffer from the illusion of skill and a failure to recognize randomness. In Chapter 2, GVF shows with more studies and meta-studies that models are better than experts. Models are even better than experts using the same models with discretion. Why is this? Models, unlike experts, are not subject to behavioral biases such as overconfidence, anchoring, framing, and loss aversion. In Chapter 3, GVF goes into more detail about behavioral biases and shows just how strong they can be. Chapter 4 explains how experts tell stories to make some approaches, such as buy-and-hold or value investing, seem like the only ones that make sense. Investors buy into these stories because they want to feel that expert opinions and judgements matter – when, in fact, they often do not. In the course of their discussion, GVF debunks a few other investment myths, such as quality enhances value and economic growth leads to higher stock returns. After GVF establishes the fact that one can beat the experts, Part 2 of the book moves on to explain “How You Can Beat the Experts.” Chapter 5 shows that it is difficult to identify competent and trustworthy advisors. GVF then lays out their sensible FACTS framework for investment evaluation. FACTS stand for fees, access, complexity, taxes, and search. You want fees, complexity, and taxes to be low, while accessibility and search ability should be high. Some of this may be obvious, but not everyone may realize that complexity isn’t usually desirable. In Chapter 6, GVF shows that Markowitz mean-variance portfolio optimization (MVO) does not hold up well in the real world due to the instability of its inputs. Research shows that equal weighting of assets does a better job than MVO or other optimization approaches. The rest of chapter 6 is devoted to old paradigm asset allocation schemes, such as the Swensen, Bernstein, and Faber IVY 5 strategies. These aim at reducing portfolio volatility by diversifying with permanent allocations to different asset classes. Since equities have provided the highest long-run returns, permanent multi-asset allocation schemes sacrifice some potential return in pursuit of volatility reduction. Someone who accepts momentum investing might prefer instead to hold only the top performing asset classes instead of all of them. Recognizing the value of trend-following timing overlays, in chapter 7 GFV lays out their own risk management framework that they apply to the IVY 5 portfolio. Because all five asset classes are permanently represented in the IVY portfolio, a trend-following exit from one asset class puts that part of the portfolio into Treasury bills, which can create a drag on portfolio performance. GVF once used a 12-month moving average (MA) as a trend following filter. They show here that time series momentum (TMOM) beats out MA as a timing model in 4 out of 5 asset classes. Instead of adopting TMOM themselves, GVF combines 12-month absolute momentum (TMOM) with a 12-month MA on a 50/50 basis to create an approach that they call robust asset allocation (ROBUST). GVF says “…the evidence suggests that combining the two technical rules seems to be the strongest performer.” But results show that TMOM and ROBUST are at least equal in their performance, and TMOM may be better. Table 7.8 indicates the winner (marked by an X) between MA, TMOM, and ROBUST, according to GVF. GVF declares a tie in two cases where there is only a 1 or 2 percentage difference in Sharpe and Sortino ratios. 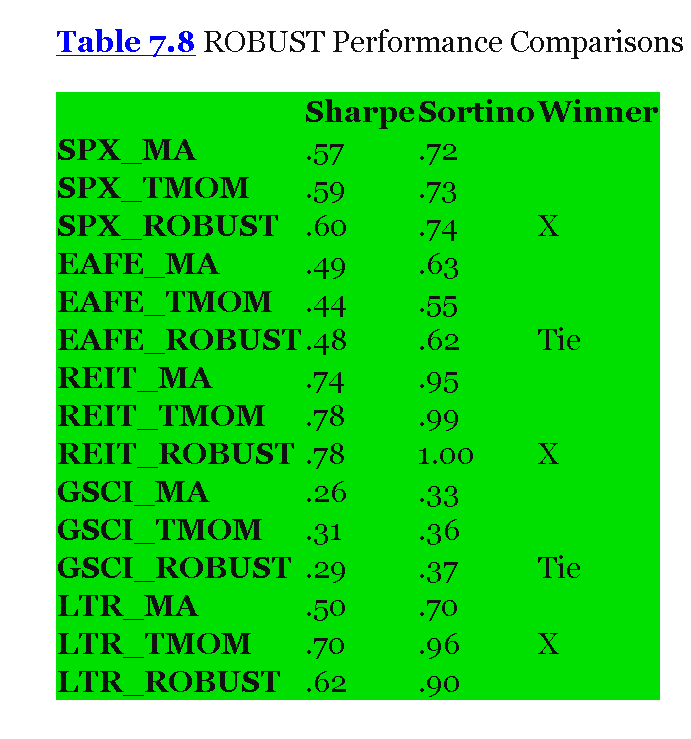 They say ROBUST is the winner in two other cases (SPX and REIT) where there is the same small difference in Sharpe and Sortino ratios. The only case among the 5 assets where there is a clear cut winner is bonds (LTR), where TMOM comes out ahead. GVF presents longer out-of-sample results for the U.S., German, and Japanese stock markets. The only clear winner there also is TMOM when applied to the Japanese market. So both in-sample and out-of-sample, TMOM shows equal or better performance to the ROBUST method before transaction costs. After transaction costs, the case is even stronger for TMOM over ROBUST, since ROBUST trades more frequently than TMOM . GVF finishes up chapter 7 by giving a good reason, besides the usual behavioral finance ones, why trend following works. This has to do with what GVF calls dynamic risk aversion. As prices drop, investors become more risk averse and do not want to step up to support prices. This accentuates the trends as markets extend beyond their fair value. GVF does not mention it, but the same logic could apply to the upside. Investors may become less risk averse as markets rise, causing trends to also overextend on the upside. In Chapter 8, GVF discusses security selection using value and momentum. The Alpha Architect website maintains an updated list of the top 100 value and momentum stocks based on the simple screening criteria that GFV presents here. GVF’s value selection criterion is earnings before interest and taxes (EBIT) divided by total enterprise value (TEV). This is covered in greater detail in their earlier book Quantitative Value. GVF shows that the top decile of value stocks from 1927 through 2014 outperformed the market, but that value had much higher volatility, making the Sharpe ratios of value and the market about the same. Both value and market had worst drawdowns of -91.7% and -84.6%, respectively. A risk factor that GVF did not mention is the idea of a value trap. Some of the cheapest value stocks may be depressed because they deserve to be based on poor fundamentals. These stocks may remain depressed or become even more depressed if they are on the verge of bankruptcy. For this reason, it may be better to invest in other than the cheapest value stocks. Moving on to momentum, GVF gives behavioral explanations of why momentum works. They show that the spread between high and low momentum stocks is close to five times the spread between value and growth stocks (18.4% versus 3.7%) from 1927 through 2014. The top decile of stocks sorted by 12-month (skipping the last month) momentum and rebalanced monthly outperformed the market by 5.4% annually, after deducting 2.4% for annual transaction costs. There is some controversy, however, about how high transaction costs might be when momentum is applied to individual stocks. Gerstein Fisher (2015) estimates that a monthly rebalanced, long-only momentum portfolio can have an annual turnover of around 300%. Lesmond et al. (2004), whom GVF cites, report that bid/ask spreads are much higher for momentum stocks. Unfortunately, this is not possible since Yahoo finance does not provide monthly charts. But you could use TMOM instead of an MA approach by inputting the appropriate ETFs into stockcharts.com and selecting a one year SharpChart that you could bookmark and look at monthly. GVF next presents enhancements to their strategy by applying both an MA and a TMOM timing filter (which equals their ROBUST method) and by substituting individual U.S. and international value and momentum stocks in place of generic U.S. and international stock ETFs. GVF has a risk-conscious allocation scheme that varies the percentages allocated to equities for balanced, moderate, and aggressive investors to 40%, 60%, or 80%, respectively. But since timing filters are meant to remove equities entirely from one’s portfolio during bear markets, the balanced and moderate allocations may be too conservative for some investors. Equities have provided the highest returns historically, and large allocations in other assets should diminish one’s accumulated wealth over a lifetime of investing. GVF provides a free service on their website that applies the ROBUST filter to each asset class for balanced, moderate, and aggressive portfolios. No one needs to pay for an asset allocation or timing overlay. They are available free, along with the top 100 value and momentum stocks, to anyone who signs up on the Alpha Architect website. GVF recommends concentrated portfolios to maximize the benefits of value and momentum investing. Modern portfolio principles tell us that a well-diversified portfolio of at least 30 stocks can eliminate most idiosyncratic risk. But this may not true for portfolios of stocks having higher bankruptcy risk. Concentrated portfolios of 30-50 of the cheapest value stocks may still be too risky. The same applies to momentum stocks. Looking at the top momentum stocks according to the Alpha Architect screener, 18 of the top 25 and 31 of the top 50 stocks are in biotech/medical technology. High intra-industry covariance means that you would need to hold significantly more than the top 50 momentum stocks to have a well-diversified portfolio. Another drawback to an individual stock momentum portfolio holding only the strongest momentum stocks is that there is a good chance some of them may be takeover candidates or may have already been taken over. Takeover stocks usually do not perform as well in the future as non-takeover stocks that showed less momentum. For the above reasons, investors may want to hold at least 100 momentum and 100 value stocks if they are selected using simple screens such as the ones presented here. How likely is it that a DIY investor would be willing to manage 100 value and 100 momentum stocks? Periodic timing model signals would add to that complexity, since you would, at times, need to exit and re-enter your entire stock portfolio. If you do not use a timing model overlay, you should be prepared for some large drawdowns and multi-year periods of significant benchmark under performance. Another potential problem with holding individual stocks is the issue of scalability. The identity of the top value and momentum stocks is readily available through the use of screeners, such the one that Alpha Architect provides. Increasing amounts of capital buying the same limited number of stocks may diminish future returns. GVF finishes up chapter 9 with their “Ultimate DIY Solution.” Here, instead of a generic REIT allocation, they recommend a monthly rebalanced portfolio of the top one-third REITs ranked by momentum (excluding those below the 40th percentile in market capitalization). In place of a generic allocation to commodities, GVF recommends a portfolio of commodity contracts selected on the basis of momentum and term structure. There are currently no domestic or international momentum ETFs that hold 50 or fewer stocks, although some may be forthcoming. There are also no ETFs that hold 50 or fewer REITs or that use momentum to select REITs. 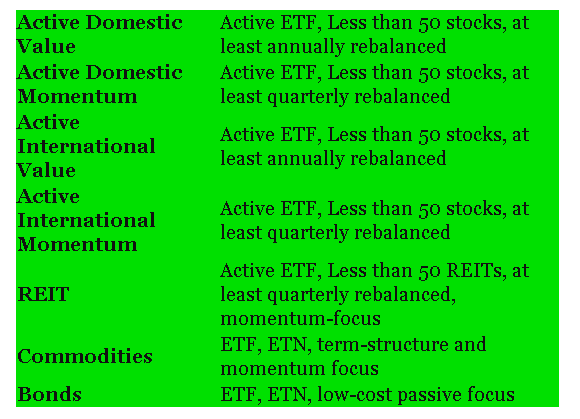 There is a just one commodity ETF or ETN with a focus on term-structure and momentum. It is the United States Commodity Index (USCI). But USCI is required to maintain positions in six different commodity sectors at all times. This means some sectors may not always have positions with a favorable term-structure. USCI does use 12-month momentum to help select its long-only positions. According to Miffre and Rallis (2006), 12-month momentum applied to commodities is profitable but mostly on the short side. Geczy and Samonov (2015) report that 12-month momentum (skipping two months) works in reverse for commodities. In other words, positive 12-month momentum is a negative factor. USCI is down 43% since its high in April 2011. In their final chapter, GVF mentions some of the reasons investors might not want to do-it-themselves. These include being able to blame someone else if things do not go well, inertia to change, unwillingness to let go of current relationships, bias in favor of experts over models, overconfidence in one’s own abilities, models not conforming to our beliefs, and the desire to be a hero. These psychological excuses are worth thinking about. . If I had been GVF, I might have said more about why investors who adopt DIY investing might abandon or change it into something that is no longer model-based. DIY investing can be simple, but it is not always easy. To be successful, DIY investing requires a good understanding of the principles underlying one’s model and the requisite discipline to stick with it under varying market conditions. 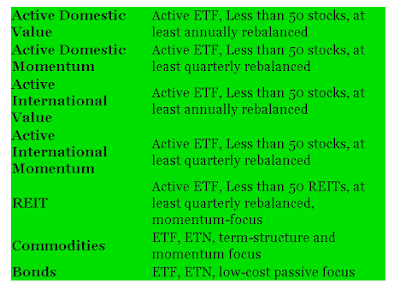 • The IVY 5 permanent portfolio scheme does not take advantage of relative strength momentum. • The ROBUST timing model trades more, is more complicated, and is no better than TMOM. • Value trap risk and intra-industry co-variance risk may make value and momentum portfolios with 50 or fewer stocks too volatile, while larger value and momentum portfolios may be impractical for DIY investors. 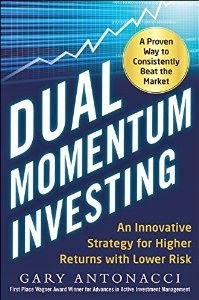 • Both value and momentum are subject to high drawdowns. The use of a timing model to reduce drawdown may be difficult with large portfolios of individual stocks. • Turnover is high, and transaction costs may offset all or most momentum profits for portfolios of individual stocks. • The most practical approach is to apply a timing overlay model to asset class ETFs. Investors can do this with TMOM and SharpCharts. Those who prefer to use ROBUST can access it for free on the Alpha Architect website. The reason I recommend this book is the good job GVF does in explaining models versus experts and behavioral biases. We can never be reminded too often of these important matters. A newer paradigm uses trend following methods to diversify among different assets on a temporal rather than a permanent basis. This means investors can focus on equities for as long as equities remain strong and diversify into other assets when they are strongest. GVF uses the term time-series momentum (TMOM) is the same as absolute momentum. 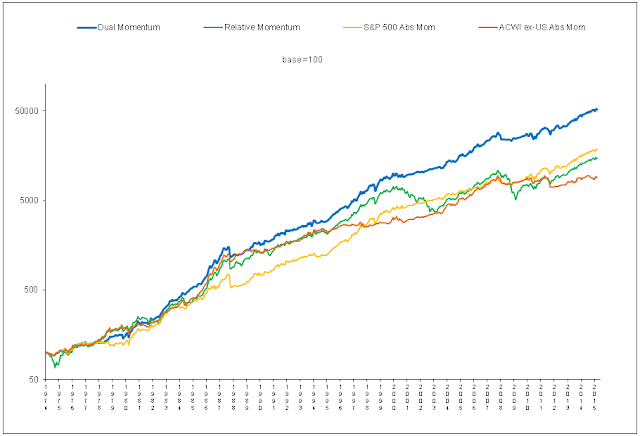 Both relative and absolute momentum are based on time series (asset returns), and absolute momentum is a better term to differentiate it from relative momentum. We use (TMOM) here to avoid confusion. GVF estimates that the MA signal has a 20% higher turnover than TMOM, while our calculations show 30% more trades. Alternatively, you could track a portfolio on Morningstar that shows performance over the past year. Timing models have a more beneficial effect on momentum portfolios than on value portfolios.